"The launch was successful. Behind him watched about 200 people. Now stands on the royal yacht marina, opposite the gates of the Solovetsky Monastery of Saints" — she said, explaining that it will soon begin sea trials of the vessel in the White Sea, near the coast. New "Saint Peter" is a three-quarters of the original. It looks almost the same as its historical prototype, but a modern boat. It is built on the latest technology and is equipped with a shipyard, in addition to sails, powerful engine and all the necessary navigation and life support systems. This solution was dictated by the challenges that boat must be addressed as a new expedition ship Solovetsky Maritime Museum. "The yacht is not intended for commercial use — explained Rapenkova. — It will be used in research, expeditions to, ideally — for trekking in the northern seas." The descent continues to ship a cultural program: excursions to places of interest Solovetsky Islands, public lectures on maritime history of the Russian North, as well as performance of "Everyday business." In addition, the Maritime Museum, the exhibition "The first ship: How sovereign yacht" Saint Peter "three centuries later returned to Solovki," introduces the stages of construction, materials, technologies and features drawings of the ship. 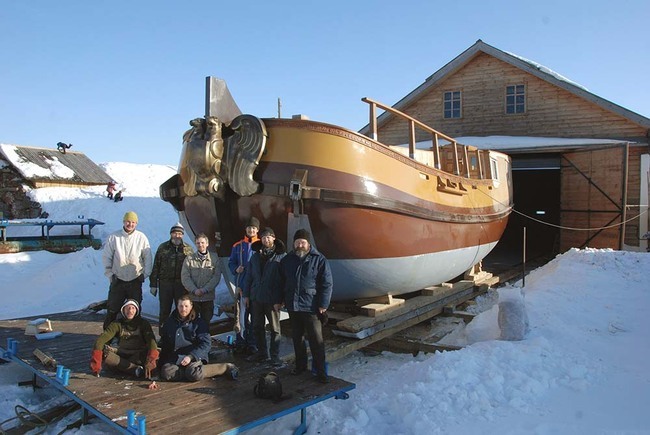 The building up of the historic vessel began in Solovki in 2003 a group of enthusiasts from all over the country — Arkhangelsk, Moscow, Novgorod, St. Petersburg. Served as a prototype for the construction of a sample of Dutch yacht "Saint Peter." This ship was built in Arkhangelsk local shipbuilders under the Dutch engineers in 1693. It emperor Peter the Great in 1693 and 1694 respectively came out into the open sea from Arkhangelsk to accompany the Dutch and English merchant ships, and sailed on the Solovetsky Islands. The ship had a single mast with sails and was armed with 12 guns. It is believed that on this boat was first raised by the Russian ship standard — tricolor. Flag king of Moscow is now kept at the Central Naval Museum in St. Petersburg. After 30 years of service is the first yacht in Arkhangelsk museum object. Imperial decree were to put it in a convenient location "and keep order." That was done, and the yacht has persisted for six years as a monument to the domestic shipbuilding industry.